When the field for the NCAA Division I lacrosse tournament was revealed, many lacrosse fans were left scratching their heads. As with NCAA tournaments in every sport, there was the usual questioning of which teams were invited to play and which ones were left to prepare for next year. This year, though, the most talk wasn’t about the fate of “bubble teams;” it was about the arrangement of the teams at the top. 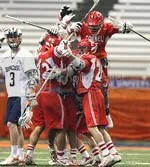 Cornell ended the regular season undefeated and atop both the media and coaches’ polls. The champions of the Ivy League had already defeated the two polls’ consensus #2, Duke, so it appeared that they would be the no-brainer #1 seed in the tournament. The selection committee, however, had other ideas. Duke received the #1 seed. Cornell fell all the way to #4, behind not only Duke but Virginia and Johns Hopkins as well. “There is a formula for seeding the tournament that is 50 percent results, 30 percent strength of schedule and 20 percent RPI,” said Maryland head coach Dave Cottle, a member of the selection committee. I won’t go into the obvious conflict of interest involved with having tournament coaches as part of the selection committee. It’s a sham, but that’s not my point for today. For now, my objection is to the enormous weight placed on the strength of schedule and the over-reliance on the formula. This won’t be a very popular argument. There are some people who feel that the world revolves around schedule strength. But there are two things that stick out as serious flaws of making simple strength of schedule a 30% chunk of the selection and seeding formula. First, strength of schedule is already factored into the RPI. 75% of the RPI formula consists of opponent winning percentage plus opponent’s opponent winning percentage. By adding a separate strength of schedule component, you end up counting it twice. The end result is that the team’s winning percentage, which really should be the biggest factor in the formula, is marginalized. Second, strength of schedule as a stand-alone measurement is meaningless. Having a tough schedule isn’t a team accomplishment. You don’t have to be good to lose to a top team; anyone can do that. Should a loss to Duke be more beneficial than a win over someone like Air Force or Canisius? It is now. If a team goes 0-14 but played the top 14 teams in the nation, that team will have the #1 strength of schedule. That means that a winless team gets 30% of the formula in determining the tournament’s top seed. Yes, I know you aren’t eligible for the tournament with a losing record. But does it make sense to use a system where that scenario is even theoretically possible? Even if the formula is tweaked, that won’t solve all the problems there are in the selection system. When you read Cottle’s comments in the linked article as well as the comments of other committee members in other stories on the same subject, you get the sense that they were bound by the formula. If that’s the case, then what on earth is the point of having a committee? It doesn’t take a committee of lacrosse experts to churn out formula results. You can do that with any random guy off the street who’s handy with a spreadsheet. The committee is either obligated to seed teams according to their formula score or they like to project that image in order to justify their selections. Neither condition is appealing. It’s never a good idea to sacrifice common sense for the “objectivity” of a math problem that is inherently flawed. Totally agree. It’s ridiculous that they count SOS as heavily as they do. There have been posts on Laxpower.com that bring up the hockey way of calculating who should be in and seeding which address this flaw. For the good of the sport it needs to be fixed, because to the casual lacrosse fan it makes no sense whatsoever. And we haven’t even mentioned all the “protect the old guard” conspiracy theories yet. If you believe those, it isn’t the good of the sport that’s most important. IF you believe them. They’ll have an ACC team in the Final 4 because Duke plays UNC. Hopkins could very easily lose to G-town. UMBC-Delaware ensures there will be a team outside “The Seven” in Baltimore. Cornell and Albany also got screwed since they have to play each other. 3 goals in 19 seconds! Just got back from the games in Annapolis. Delaware’s defense is good enough to handle Hopkins. Alex Smith is simply amazing at the faceoff “x”. I think they have a legitimate shot at beating JHU. Duke is Duke. They were down 6-1 at one point but you never felt that they were out of it. They outscored UNC 18-5 from that point on. Delaware-UMBC was back & forth for most of the game, but when Delaware went on a little run, UMBC couldn’t answer because they just couldn’t get the ball back. I like how there’s a new look every time I come back here. I think you’ll run out of themes soon though. This should be it. It’s a bit more compact.